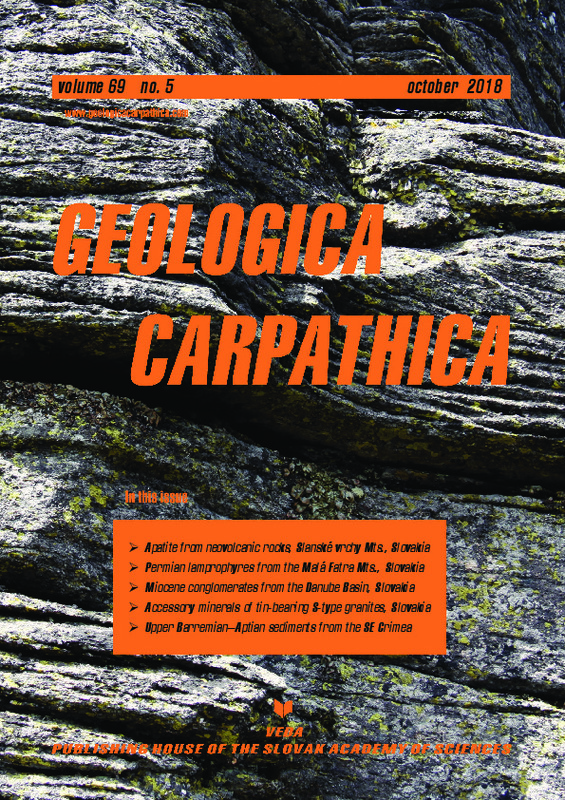 Abstract: The S-type accessory mineral assemblage of zircon, monazite-(Ce), fluorapatite and tourmaline in the cupolas of Permian granites of the Gemeric Unit underwent compositional changes and increased variability and volume due to intensive volatile flux. The extended S-type accessory mineral assemblage in the apical parts of the granite resulted in the formation of rare-metal granites from in-situ differentiation and includes abundant tourmaline, zircon, fluorapatite, monazite-(Ce), Nb–Ta–W minerals (Nb–Ta rutile, ferrocolumbite, manganocolumbite, ixiolite, Nb–Ta ferberite, hübnerite), cassiterite, topaz, molybdenite, arsenopyrite and aluminophosphates. The rare-metal granites from cupolas in the western segment of the Gemeric Unit represent the topaz–zinnwaldite granites, albitites and greisens. Zircon in these evolved rare-metal Li–F granite cupolas shows a larger xenotime-(Y) component and heterogeneous morphology compared to zircons from deeper porphyritic biotite granites. The zircon Zr/Hfwt ratio in deeper rooted porphyritic granite varies from 29 to 45, where in the differentiated upper granites an increase in Hf content results in a Zr/Hfwt ratio of 5. The cheralite component in monazite from porphyritic granites usually does not exceed 12 mol. %, however, highly evolved upper rare-metal granites have monazites with 14 to 20 mol. % and sometimes > 40 mol. % of cheralite. In granite cupolas, pure secondary fluorapatite is generated by exsolution of P from P-rich alkali feldspar and high P and F contents may stabilize aluminophosphates. The biotite granites contain scattered schorlitic tourmaline, while textural late-magmatic tourmaline is more alkali deficient with lower Ca content. The differentiated granites contain also nodular and dendritic tourmaline aggregations. The product of crystallization of volatile-enriched granite cupolas are not only variable in their accessory mineral assemblage that captures high field strength elements, but also in numerous veins in country rocks that often contain cassiterite and tourmaline. Volatile flux is documented by the tetrad effect via patterns of chondrite normalized REEs (T1,3 value 1.46). In situ differentiation and tectonic activity caused multiple intrusive events of fluid-rich magmas rich in incompatible elements, resulting in the formation of rare-metal phases in granite roofs. The emplacement of volatile-enriched magmas into upper crustal conditions was followed by deeper rooted porphyritic magma portion undergoing second boiling and re-melting to form porphyritic granite or granite-porphyry during its ascent.